A tombolo is a natural sandbar that connects an island to the mainland, or an island to another island. The latter is the case with the tombolo between Kiket and Flagstaff Islands in the Kukutali Preserve. They are built by wave action and currents flowing along the shoreline. A large driftwood field has formed on the south side (left in the photo). Broken clam shells marked the pathway along the sandbar. This is a traditional place of food gathering by the Swinomish people. A history of this activity is preserved by the broken shells. As you can see in the photo, significant erosion has taken place. The clam shell path now veers off onto to the beach. This is recent, occurring sometime between November 16th and December 1st. 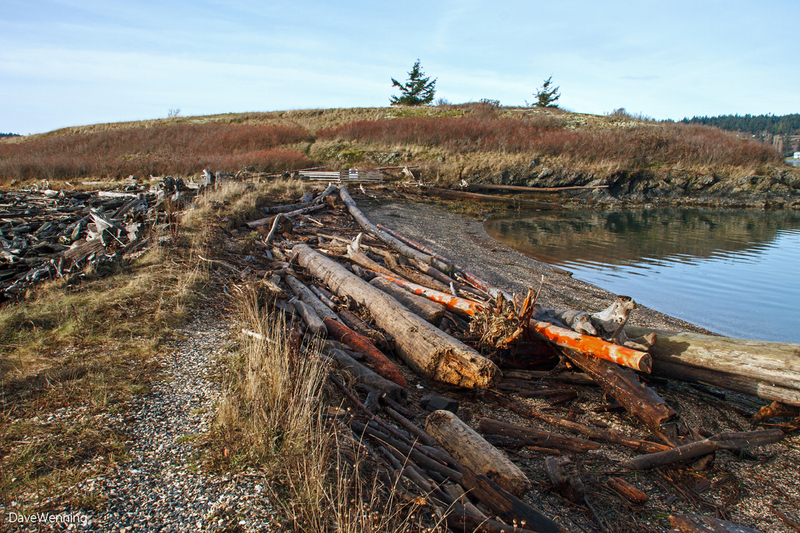 The accumulation of driftwood on the right is also new. This section was previously a clean gravel beach. This is a closer view of the erosion. 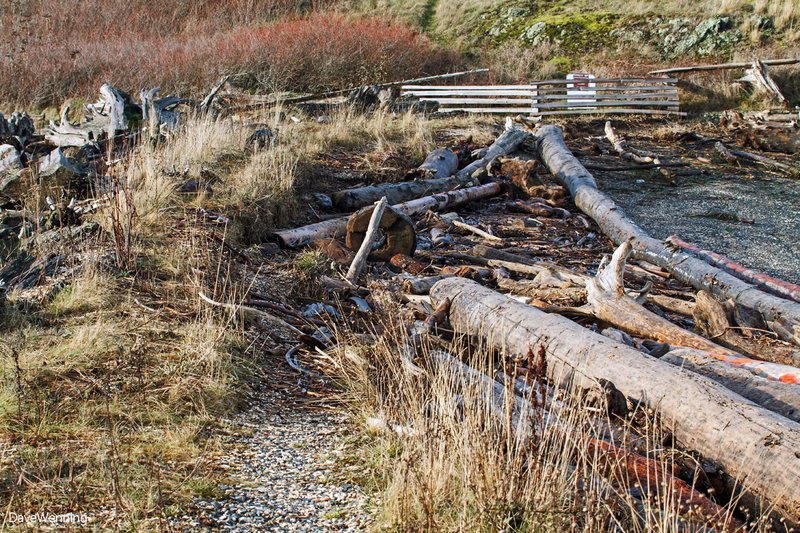 A section of the clam shell path has washed away, then picks up again closer to the split rail barrier. Visitors are creating a new path along the narrow strip that remains. As I can perceive, nothing has been done here by preservation efforts to cause this. I am wondering if the accumulation of new driftwood on the north side is disrupting the normal wave action. Could this be causing the erosion? Will the erosion eventually break through completely and separate the two islands? Would removing the driftwood allow the sandbar to rebuild? Is climate change playing a role here? One thing is for sure. Nature can build and nature can also destroy. Dave - Thanks for passing along the observation. I looked at a similar photo I took back in 2009 (http://gravelbeach.blogspot.com/2009/10/kiket-island.html) and definitely see what you're referring to. This is basically a pocket beach and they tend to be fairly stable in the long-term (since no net gain/loss of sediment), but can experience cycles of erosion/accretion due either to 1) storm/tide combinations (in which case you might see a corresponding accretion lower on the beach profile) or 2) shifts in sediment from one end of the beach towards the other (in which case, this erosion might be matched by accretion at the eastern end). These north-facing beaches don't tend to get much action, but when cold winds come down the Fraser, all sorts of things can happen. And yes, logs may play a part, although their role can be pretty unpredictable.